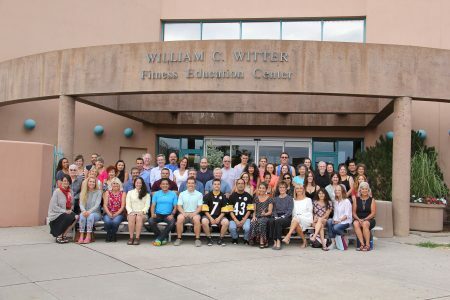 Welcome to Santa Fe Community College’s William C. Witter Fitness Education Center. This 124,000 square foot facility has everything you need to shape up, assess your health and fitness levels or just relax. The March 14th Reopening Celebration has been postponed due to the weather. Women’s: Monday and Friday from 1 to 2 p.m.
Men’s: Wednesday from 1 to 2 p.m.
To use the facilities, enrollment in a fitness class is required; bring your student ID. If you prefer not to enroll in a class, you may purchase a one-month pass for $50. Passes give you access to open activities and gym areas as available. You can also purchase one-day passes for $8, or a 5-visit card for $30, all at the Fitness Education Center reception desk. Unless you are enrolled in a class, ALL 1-day, 5-day and 30-day pass users must be 16 years of age or older.